Pinterest.com, I found, can help. You probably know it. For me, it’s a great resource for recipes; a visual way to pick through the hoard. It’s basically an online picture-book that covers a multitude of topics such as food, fashion, hair/makeup, celebrities…you name it. The visuals are so interesting and beautiful at times that they will give you the urge to do or make things you haven’t even thought of before. Like tying your hair into a bow for example or suddenly wanting to make Strawberry Cake; its pink cake with pink icing! Such a cheerful prospect, no? 🙂 Just waiting for an excuse to make it. Is anyone celebrating a birthday soon? How does Strawberry cake sound? I’ll tie my hair into a bow… Anyway, I digress. Through Pinterest I discovered a blog called “Just a Taste” by Kelly Senyei and I immediately loved it. It seems to be where all the most delicious looking food goes to live. I have made three of her recipes so far, this one among them, and the results truly lived up to the delicious looking imagery. 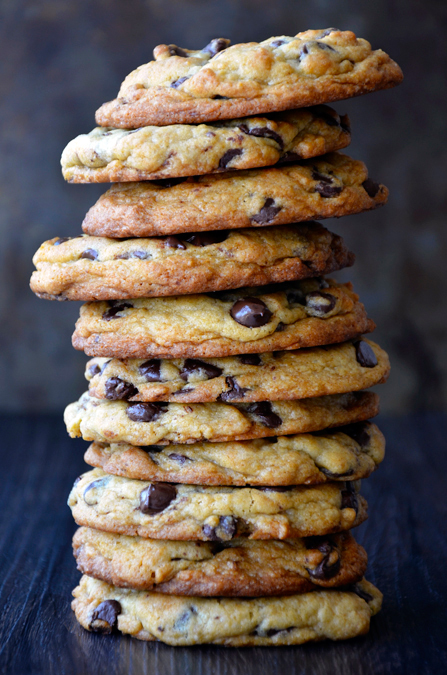 There are tons and tons of Chocolate-Chip cookie recipes out there so why do I love these? Why are they the best? The secret ingredient must have something to do with it. I found that the flavour is very similar to Mr. Christie’s Chips Ahoy cookies, that familiar and comforting taste, but without the dry and crumbly part. That won me over along with the bonus of home-made deliciousness – soft in the centre and crispy along the edges. Trust me, these will be YOUR Secret-ingredient Chocolate-chip cookies – your go-to recipe – from now on. So have you guessed what the secret ingredient is? Have you been wondering all through my bla-bla-blage ? Please: Use regular full-fat cream cheese. You’re already making cookies for goodness sake, don’t go low fat! Plus its only a quarter cup for the whole batch. 🙂 Do not over-cook them, they need to be a little softer in the centre and crispy along the edges. In the bowl of a stand mixer fitted with the paddle attachment, cream together the butter, cream cheese, sugar, light brown sugar and vanilla extract until light and fluffy, about 2 minutes, scraping down the sides as needed. Bake the cookies for 9 to 11 minutes, or until golden brown. 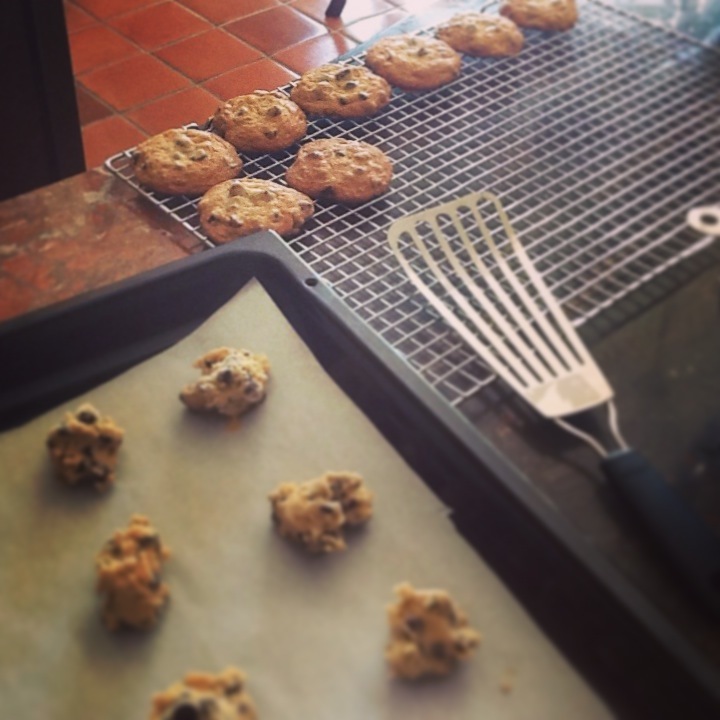 Cool the cookies on the baking sheets for 2 minutes then transfer them to a wire rack to cool completely.